Cash Money Degreez: Will Mannie Fresh Reunite With Lil Wayne At Bonnaroo? Will Mannie Fresh Reunite With Lil Wayne At Bonnaroo? In preparation for the Bonnaroo music festival beginning today in Manchester, Tennessee, legendary hip hop producer and longtime Cash Money Record collaborator Mannie Fresh has been pegged to craft a hip hop remix of the festival’s official theme song. The theme song, “Bonnaroo (Feel The Magic),” was written by longtime bluegrass musician Del McCoury and the Preservation Hall Jazz Band. A story retold by Preservation Hall member Ben Jaffe said that McCoury got the idea to pen the song in a band partnership while stranded in a snowstorm during a joint tour between McCoury’s group and the Preservation Hall band. The news of Mannie Fresh providing an update to the feel-good original should be thrilling to fans of the producer who gained fame as the in-house producer for New Orleans indie powerhouse Cash Money Records in the 90s. Mannie has also found some notoriety as a rapper alongside Cash Money label boss Brian “Birdman” Williams as part of the Big Tymers duo, of which the pair has released five albums. Citing money issues in 2005, Fresh moved on from the Cash Money confines and began work as an artist and producer for Def Jam South. His second and currently most recent solo album Return Of The Ballin’ was released in 2009 and featured southern rap greats Rick Ross and Lil Jon on one track. Rumors are rumbling about that Mannie Fresh will be in attendance at Bonnaroo which makes for an interesting scenario since former label mate Lil Wayne is one of the headlining rap acts of the festival along with Eminem and other big names. 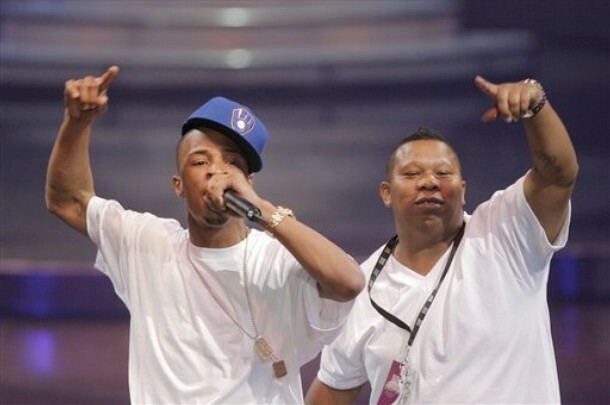 Could a possible reunion between YMCMB and Mannie Fresh be on the horizon this weekend? The Bonnaroo festival begins today (June 9) and ends on Sunday (June 12).